Hello vintage lovers, and foot fetishists who have stumbled here accidentally due to my use of the words 'gratuitous shoe pictures'. Today I will be showing you some of the shoes I have acquired in the last few months, and for some reason or another haven't shown to you! There will also be some tips on vintage shoe buying. This first pair aren't vintage at all but they are going to go fabulously with my Summer outfits. Coral red was in my Autumn/Winter colour picks although I didn't manage to feature it much, but my Spring/Summer colour picks will feature a more pastel/bright version of the same tone. These are £18 from TU at Sainsbury's supermarkets (in their current collection, I got them at the weekend), and they're really comfy. 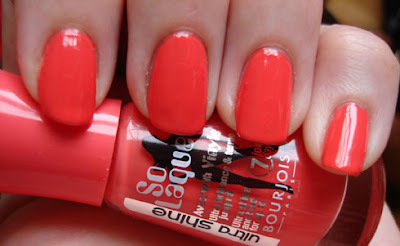 I also got a nail polish that matches exactly in a swap with a friend, it's Bourjois Tangerine Fatal. Amazing black velvet 1950s stilettos from RevolvingStyles on etsy. My friend Paul gave me cash for my birthday, so I bought these. They're the superspy shoes from my birthday wishes post! The heels are so curvaceous, and despite having some marks to the soles, the linings and uppers of these look like they've never been worn. 1980s black velvet stilettos... yeah, yeah, they're almost exactly like the ones above. But they were £2.99 in a charity shop, had never been worn, and I only have one other pair of black shoes. Cinderella shoes! I got these back in October so I have no idea why I haven't posted about them yet, seeing as they are the most beautiful shoes I own. When Brittany of Va-Voom Vintage posted these on her blog, I couldn't move my fingers fast enough to write her a message asking for them to be reserved! I paid a visit to her etsy shop and snapped these up at a very reasonable price. These things are pretty scarce in the UK, and even scarcer in a size actually wide enough to squeeze in a modern foot - they're just wide enough for me to rotate my trotters into comfortably. Here's a few more pictures of my 1950s lucite lovelies, all these pics are copyright of Va-Voom Vintage. There were a few little stones missing, so I replaced them with some vintage ones I had, from the same period. Now, to the vintage shoe shopping tips. In this shoe, you can see two sets of letters. This denotes a high quality shoe - the letters are separate width fittings for the heel and toebox, and would only be found in custom-fitted shoes. Widths generally went from AAAAA to B or C. AAAAA can also stand for AAAAArgh these vintage shoes are far too narrow for my portly modern feet and are making me want to chop off my own toes. Then again - I have found that these fittings can vary between manufacturers and even between decades - I am a modern UK 5.5, US 8 with a very slightly wider than average foot, but I have 1950s shoes that are tight on me at size US 8B, Fit fine at US 8.5AAAA, and 1940s ones that are snug at supposedly the exact same size, 8.5AAAA. So, in conclusion - don't try to use these fittings as an exact size guide, just take them as a sign of a very well manufactured shoe that was built to last, but go by measurements instead. Measure a shoe that fits you very well across the widest point of the sole at the ball of the foot, the length along the insole, and the distance across the vamp (the front part of a shoe that covers the top of your foot). If you buy on etsy which is a very good source for vintage shoes, most sellers will list this information. If buying at vintage fairs, take a tape measure and a clean stocking - there's no point trying shoes on when you're wearing massive thick socks or have a sweaty foot which will make the shoes stick and feel uncomfortable. Another hugely important thing to remember is that the width of your bare foot flat on the floor is not the width you need in a heeled shoe - the sole of the shoe will be considerably narrower due to the way heeled shoes hold the foot, so as I have stated before, measure a shoe that fits you well, not your foot. 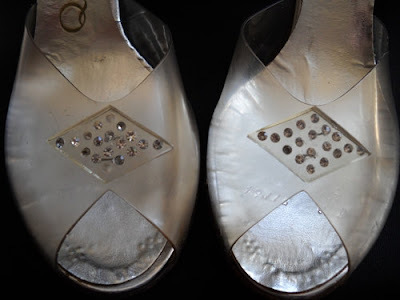 Metal heel and toe taps - these are another sign of a well-made shoe, especially the presence of toe taps. 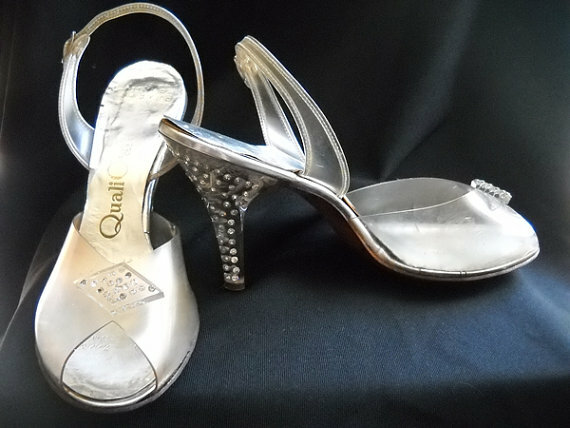 Many vintage shoes have hard leather soles, so check these aren't worn out or rotten, and have leather heel taps replaced with matching coloured plastic or metal ones by a good cobbler if you intend to wear the shoes outdoors much, as these will wear down very quickly and cause damage to the heels. Shoes with different writing in each one show that they were made exclusively for a fancy shoe shop or department store. One logo shows the maker's name, the other the shop. These were good quality shoes made for upmarket outlets. Good names to look for are De Liso Debs from the 40s, Roger Vivier, Spring-O-Lators, Magnin department stores, and Johansen from the 50s, Daniel Green in boudoir slippers, celebrity endorsed lines like Jayne Mansfield shoes, and of course designer treasures such as Ferragamo. The words 'hand lasted' mean that the fabric or leather of a shoe has been stretched out over the foot-shaped mould by a human, not by a machine. This is generally a sign of quality, but in the 50s and earlier hand lasting was still commonplace anyway, so don't let it sway you too much. Look at the quality of the stitching, the materials used, and whether they have deteriorated over the years making them too fragile to wear. A shoe stretcher. 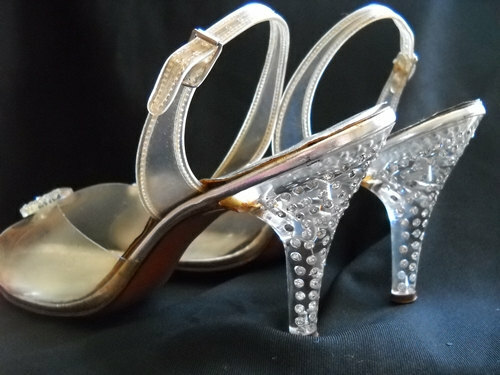 One or a pair is an invaluable purchase for anyone wating to wear vintage shoes. If your feet are very much a modern size, you'll probably find width an issue when wearing vintage, and this handy gadget is great for gently easing out vintage shoes without putting any undue pressure on one part of the shoe or creating creases in the material. They put equal, firm pressure on all areas of the shoe that the wooden part is in contact with, and are adjustable to many different sizes and foot shapes. Using a shoe stretcher to gently reshape vintage footwear is highly preferable to trying to wear shoes in, as it preserves their shape and avoids damage to your precious vintage items. Be gentle though, adjusting your stretcher just a tiny bit each day over several days - you're not going to make a shoe whole sizes bigger, or make a shoe you can't get the width of your foot into comfortable to wear. Be careful and remember that these are historical items, you're their custodian, so care for them well. A lovely post doll. Very useful with the measuring tips and all!!! ug, I just wanted to edit the comment not remove it. Let me try again..
You said those first shoes were not vintage, are they avaliable online (I live in the US and have never heard of that store - seraching online now)? I have to admit, I barely made it through half of this blog post before having comment and ask because they are so lovely and I need a pair! I promise to go back up and finish reading your post now. They're not available online, I just checked :( It's a UK supermarket chain, and for some reason, unlike the other big chains, they don't sell their clothes online! Shelly's do a similar style called the 'fruity' mule, I don't know if you'd be able to source those in the US? Glamourous styling and my clever chap! Kalandra Jane Designs Magazine Feature!